ICE-3 Racing’s Lukas Zaugg was the victor of the 2018 AR2.0 Magny-Cours Feature race, snatching the lead from Katie May on the final lap. The lead changed hands a number of times at the beginning of the race; polesitter Kyösti Pykälistö was able to hang on at the start of the race, but endured a thrilling scrap between himself, May and team-mate Marjolein Postma for the initial advantage. May and Postma both had their chances at the front too, but didn’t possess as much pace as Pykälistö in the first half of the race. The Finn then met his match; impressive rookie Vaclav Malsyz was able to make huge inroads into Pykälistö’s lead and eventually passed the Vivendi driver at Adelaide on lap 15. The fans who elected to sit at Adelaide would most certainly get their money’s worth; although Malsyz was impressive in defense of his lead, he was unable to keep the late charges from May and Zaugg at bay and both passed him at the infamous hairpin. 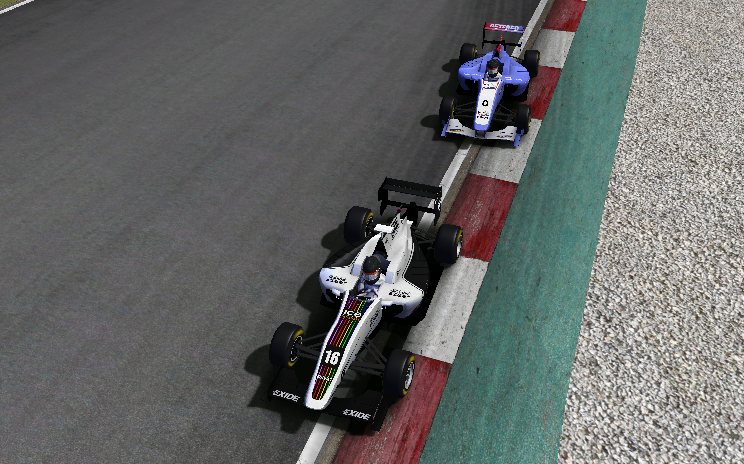 Zaugg then attached himself to May and showed his intent on the final lap; the Austrian had a terrific run out of Estoril and made a last-minute lunge down the inside of the DMR driver to emerge in the lead. Although May pushed Zaugg right up to the end, her chance to win had gone. Malsyz was a very close 3rd, the Czech driver proving a very astute driver in his first season at this level. Pykälistö came home in 4th place, and extended his championship lead to 38 points. Although the race was less incident-packed than the previous round at Monza, the fast, tight combination of turns 7 and 8 proved a headache for a number of drivers. Debutant Nelson Odewa, a late substitute for the banned Rach Moore, was caught out by Skye Summers tipping him into a spin at turn 7 causing the Nigerian to end up in the wall. No action was taken; the stewards judged that Summers had taken the racing line. Similar fates at the same corner befell title contenders Yaël De Bock and Sølvy Ødegård; the former tried to turn into Tyger Winters and ended up in the wall, whilst the latter was embroiled in a duel with Sofia Bonaventura as Ødegård looked to recover from her lowly grid position. Ødegård avoided the wall, but ultimately her hard work was undone and she sank to 21st.